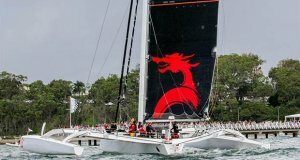 “It’s shaping up to be an interesting race with a lot of VMG sailing downwind”, Wild Oats XI crew member Mattie Mason told Sail-World.com/nz this morning just over three hours before the start of the Rolex Sydney Hobart Race. “There’s a chance that some of the boats will push hard and go well to the east – that will cause some separation in the fleet which is always going to be interesting. Mason, a four times America’s Cup winner and long time Wild Oats XI crew member, said the options for Wild Oats XI would only be decided once they got clear of Sydney Heads and could assess the conditions, and start running towards Hobert. The routing from Predictwind shows the breeze being well around to the north, meaning the older supermaxis yachts like Wild Oats XI and Black Jack, with their narrower beam, have less drag than the more recent designs such as Commanche and can sail a more direct course. The newer boats need to be more powered up and sail a higher or “hotter” angle to achieve their optimum speed to reach the finish line in the fastest time. If the Commanche’s sail to their VMG their routed course is around 150nm longer than the rhumb line to Hobart. The new sails include a new A2 used for downwind running; a new Code Zero used more in reaching conditions and a new J3 which sits inside the other two and is expected to get a lot of use. Top Volvo Ocean Race and offshore navigator Juan Vila will be back on board Wild Oats XI. “We see a sea breeze building at the start, quite a nice northerly or NNE. Then we might get up to 20kts when we get further offshore past the Heads. Vila is expecting to see a light-air Bass Strait crossing, and then with a good northerly picking up by the end of Bass Strait for the run down the Tasmanian coast. Vila expects the fresh northerly to only last a couple of hours or so before it gets really light. 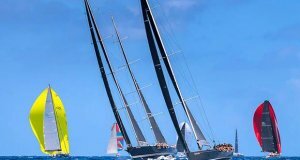 The decision on whether to take a more offshore course favoured by the routing will have to be made very early in the race, Vila explained. “All the models look like a VMG race,” he added. “The course is longer if you take the offshore option. However you keep the wind for longer – so it just depends on how it all pans out”, Vila concluded. If the conditions pan out as predicted most are tipping a TP52, probably last year’s winner Ichi Bann to take the overall trophy. Update: The Rolex Sydney Hobart Yacht race got off to a good, clean start in a useful seabreeze, with Wild Oats XI snatching an early lead. However as the boats were clearing Sydney Heads the wind dropped in ahead of an advancing seabreeze hitting 15kts plus and slightly forward. 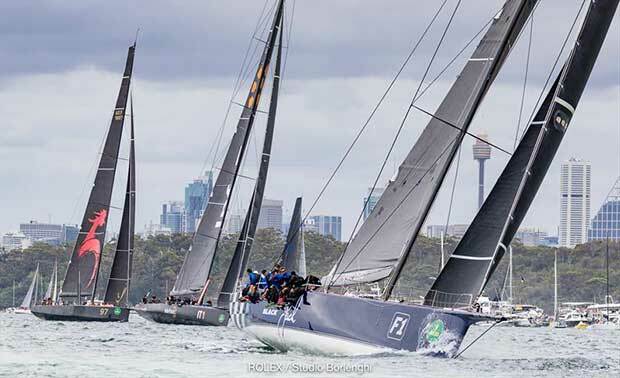 Black Jack had a good lead coming out of the heads dropping the fleet, but as race record holder Comanche got a sniff of the increased pressure she was able to heel sufficiently to just sail catamaran style on her leedward bilge, and ran a very useful course down the NSW coast. Early in the leg the two “fatties” Comanche and InfoTrack did head offshore sailing a hotter angle, but then gybed to come across the bows of the inshore group, with Comanche hitting over 27.5kts. It appeared that the group of five supermaxis had all elected to stick close to the rhumb line route down the NSW coast, while the breeze stayed fresh and in the north. That could make matter a little awkward for Comanche on the first night if the wind lightened and she could not get across to the stronger pressure offshore. Past Wollongong, Comanche led from InfoTrack and Wild Oats XI. Surprisingly she was ahead of the 2017 record pace to the tune of almost 15nm.